Lost among the multitude of announcements and happenings for Gliph this past weekend was the introduction of our Responsible Disclosure Program. As a platform focused on providing security and privacy, it is important that we involve everyone willing to help us keep the Gliph community safe. We created a page to officially describe our Responsible Disclosure Program for whitehats and announced the first contribution from a security researcher. Anand Prakash, (@sehacure) a student at Vellore Institute of Technology in kanchipuram, Tamil Nadu, India has proved a helpful early contributing security researcher to Gliph. We would like to thank him for his work. If you are a security researcher, we encourage you to check out the program and reach out to us if you have any questions or feedback. You can reach us at security at gli dot ph. This entry was posted in Gliph News, Gliph Platform, Privacy, Security and tagged bugs, disclosure, security, whitehat on May 21, 2013 by rob. 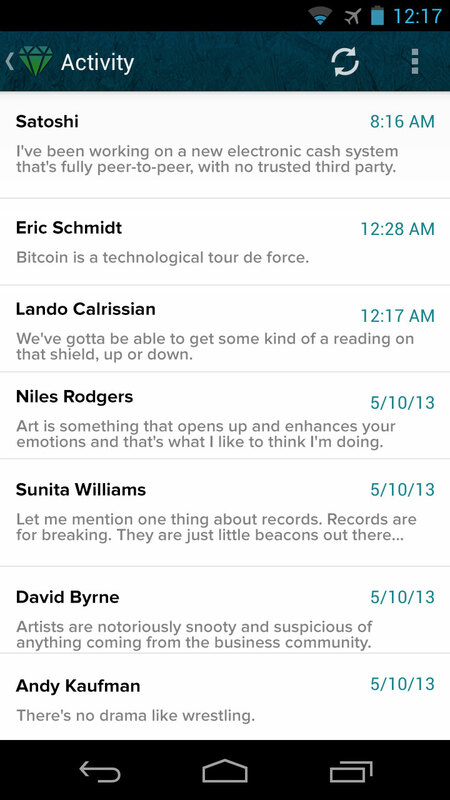 Today we’ve released version 1.1 of the Gliph Android application to Google Play. Our Android users have been very patient in waiting for updates, and today marks solid progress. This entry covers both the updates and how to use the new Bitcoin functionality in the app. You may enjoy the demo video of how awesome Bitcoin can be on Gliph available here. Gliph for Android 1.1 catches up with the mobile web and iPhone application in a number of areas. First, we’ve updated the Activity View to show the actual tags of the connections you’re talking with instead of the Gliphs themselves. The conversation view has been touched up, also bringing connection tag, first name or pseudonym facets into view, rather than the Gliph. While we love the Gliphs, and know some people use them as their central identifier for other people, we have also gotten feedback that it is hard to keep track of who is who when you have many contacts. So now there is more consistent styling across iOS, Android and the web. This entry was posted in Bitcoin, Gliph Android App, Gliph Messaging, Payments and tagged android on May 17, 2013 by rob.